UPDATE 8/1: All Mood Board demos are full but the meet and greet/signing event with special guests is still open and you can RSVP to anthroevents@anthropologie.com for your preferred location below. The second invitation below is for you! Hello everyone! 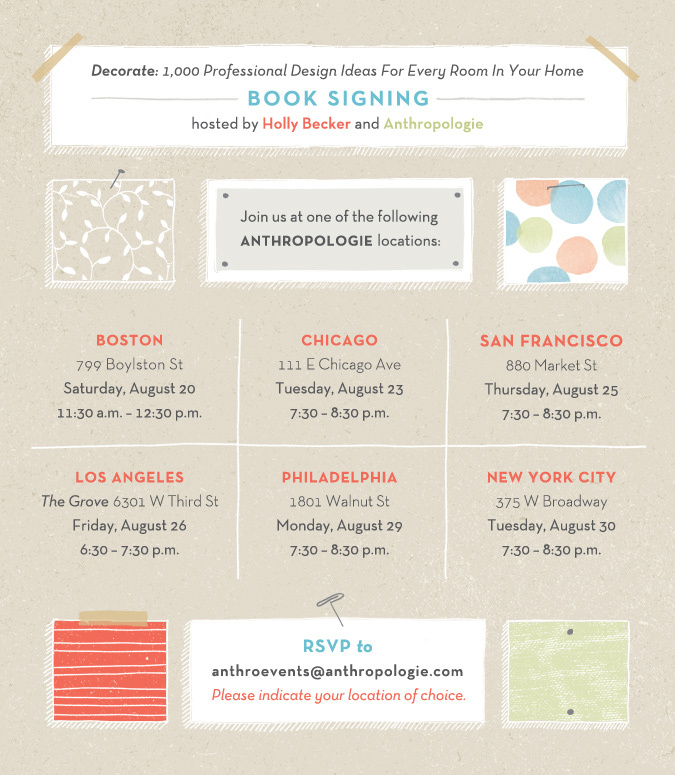 It's August 1st and I've been dying to share this amazing news with you for months now ever since I first found out that Anthropologie (insert squeals of delight here) would be hosting the official Decorate Book Tour in the U.S. this month! Yes, this month! PLEASE READ the bullet points below the invitation and mark your calendars because it's time to meet up! I'll soon be on the road visiting 6 stores that both Anthropologie and Chronicle Books selected for me and I'm very excited to hang out with all of you and have some fun. I'm flying over alone from Germany and staying in the states for two weeks, which is quite exciting and seems very glamorous - I still can't believe it - it's a once-in-a-lifetime event so I'm going to just jump in head first and go for it despite the butterflies that I feel! I'm ready to meet you all and share lots of inspirational ideas and the special people that I have lined up to attend as special guests alongside of me as I hop around. I also must add that I can't wait to be back home in America, even though I love being abroad there is nothing like being home in the USA! Here's the plan... I'll be kicking things off in Boston on Saturday morning, August 20th, so it's a special spot to begin the tour for me. From there, I'll visit Chicago, San Francisco, Los Angeles, Philadelphia and New York. In August, I'll even be at the London Anthropologie store on Kings Road for a special brunch event...that will be on September 25th, more on that in a few weeks but mark your calendars! * To attend a mood board + book signing event, please email anthroevents@anthropologie.com with your name and the store where you plan to attend. * Mood board events have extremely limited space so there is a chance that lots of you may not be able to attend my 30 minute demonstration but that's okay... UPDATE 8/1: LA, Boston, San Francisco and New York Mood Board demos are booked but you can still attend the meet and greet/book signing portion of the event in those cities according to the second invitation below. 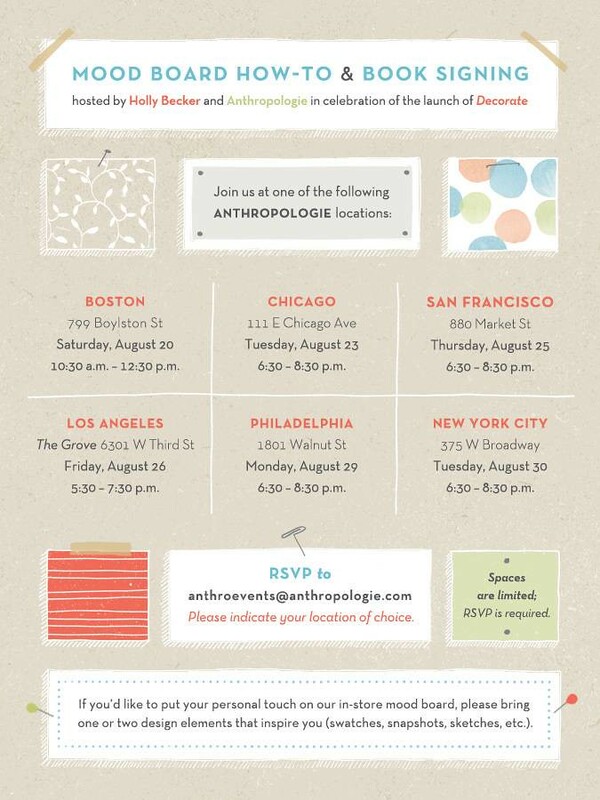 You'll need to still RSVP to anthroevents@anthropologie.com but everyone is invited so please come along for a fun event! I won't be back in these cities for quite a long time so this is our big chance for bloggers and friends to meet up. :) You should still plan on attending right after the demo wraps up. In fact, if Anthropologie cannot accommodate your request for the mood board event don't worry, they will add your name to the actual book signing/meet and greet event immediately following which will be a larger crowd, more mingling and when you'll get to meet me and have your book signed. * If you are confirmed to attend the mood board event, please bring some items to pin on the board that we plan to use for the demonstration. Bring things that can be pinned (nothing heavy or too large) such as tear sheets from magazines, ribbons, fabric swatches, etc. showing the types of spaces and things that inspire you.... you can put together a little envelope of bits to bring along and together we'll pin them to the Decorate Mood Board at Anthropologie. *If a mood board demonstration sells out, I will update this blog post with the cities where it has sold out -- BUT you will be put on the official guest list to attend the meet and greet/book signing during the same time frame, immediately following the mood board demo, because then I'll be able to talk to you, sign your book, introduce you to others, etc. * Each location I visit will have special surprise guests who contributed to Decorate. I'll introduce them to everyone during the event so you can meet them - from top interior designers to your favorite bloggers and magazine editors. Bring your business cards, it will be a great networking event, too! If the mood board events sell out, this invitation below is for you so please print it out and hang on to it - also make sure to RSVP as well! I'm so honored that Anthropologie will host my first ever book tour, I'm so flattered and happy about it but beyond the excitement I have to sign books in their gorgeous stores, I'm so happy that I can finally get a chance to meet all of you in person. I also must thank my publisher, Chronicle Books, for working so hard to plan these events for me and for sponsoring this big book tour for me. I still can't believe that this is all happening and I'm thrilled. I just found out that Decorate will be re-printed in both the US and UK for the THIRD time and all of this happened because of you, my readers and friends, so please attend one of my events so I can thank you personally for being such a big part of this dream come true in my life.